Seasonal books are on the way! Get your kids in the holiday spirit by sharing with them A Christmas Secret by Candace Hall. 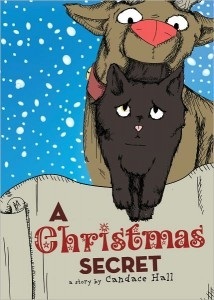 Santa’s reindeer discover a lost black kitten named O’Malley while they are helping Santa deliver presents on Christmas Eve. Unable to find his home, they hide O’Malley on the sleigh and keep his presence a secret from Santa. Once they arrive back at the North Pole, many of the residents help take care of the tired, hungry little kitten. What would Santa say if he knew? This is an unbelieveably adorable story. You have Santa’s reindeer acting like a kid hiding something he discovered on the way home from school. They know they’re not supposed to bring O’Malley home, but what are they going to do? It’s cold out. Besides, isn’t Christmas the season of peace, love, and joy? While I wish the interior illustrations were in color, they are still cute. The small size of the book makes it easy for little hands to hold too. Your children will be enchanted by A Christmas Secret by Candace Hall. I received a copy of this book from the author through Pump Up Your Book in exchange for my honest opinions. I received no monetary compensation of any kind to provide my review. Awww…thanks for the wonderful review, Cheryl! You’re welcome, Dot. It’s a cute story.